At the moment of writing this, it is the morning on 6/30/2016. The June month was focused strongly around the Brexit vote. The market was rather uncertain coming up to the vote but eventually believed that Britain would vote to stay, leading to a rally right before the votes. The resulting vote was for Britain to exit the EU. This cause a lot of shock and the pound dropped instantly and many markets including the USA had their indexes plummet. 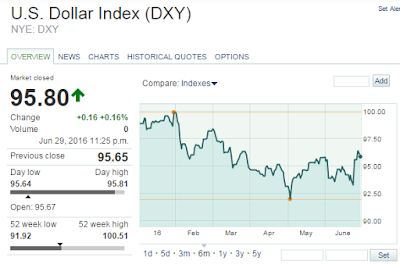 We saw the S&P drop from $2113 to $1992. Eventually the S&P rebounded. I really hope this rebound is temporary as I was really hoping for a Brexit to cause tanking share prices for bargain basement deals. Brexit or not, I will continue investing in companies that are decent value. I will be willing to pay a premium for high quality companies. I believe in dollar cost averaging my investments since I don't think that I am smart enough to time the markets. The S&P is still close to its high, making it very difficult to find decent bargains. Utilities and consumer staples have been rising higher this month. Oil still remains around the $50 level. There was a dip in the oil inventory which cause the oil to spike as I write this article. The S&P today is dictated by the moves in oil. 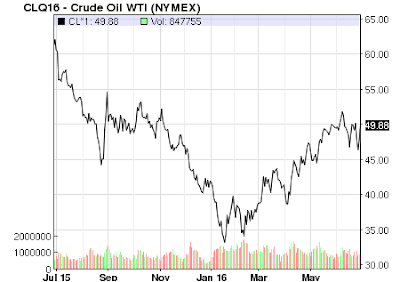 Higher oil means higher stock prices, ironically, even though most companies benefit from lower oil prices. Higher oil signals economic demand and growth which investors like to see nowadays. 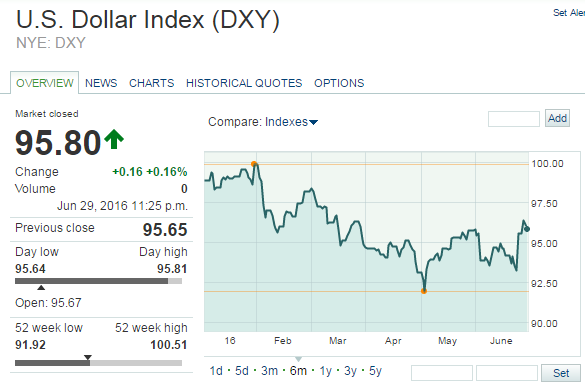 The US dollar got slightly stronger after the Brexit vote, primarily due to the weakening Pound. The UK also got their financial rating degraded by the Standard and Poors from AAA to AA. The focus of this website and this portfolio is income generation. I want to eventually generate so much income passively that I no longer have to work or worry about my personal expenses. I want other people to work for me. Owning shares is essentially that. You, the share holder, own a part of that business. In that business, the executives, managers, employees, and capital machinery all work for you to generate more money. The goals of the CEO and other executives are to generate more and more money every year. Whether that profit making be done through improving margins, buying other companies, creating revolutionary products, or raising prices, the share holder will get a share of that profit. By owning businesses, my eventual main income stream will be from the businesses; not from my 9-5 job. A layoff or a surprise in life will not be the end of the world in this scenario since now my sources of income have been increased from my single primary 9-5 job to dozens of different businesses. Getting stuck in a paycheck to paycheck system with a single job is a terrible way to diversify and is very risky. Every year, I expect the businesses that I own will each generate larger and larger checks to me without me having to contribute a cent. It is nearly impossible for one to have a noticeable pay raise year after year from his boss. After all, wages have remained stagnant for decades while corporate profits have gone up substantially in the same period of time. This is because profit sharing is with the high level employers and business owners, not the employees. One must own businesses or be an executive to have a representative share of corporate profits. This is why I invest in dividend aristocrats, companies that have paid increasing dividends for 25 or more years straight. At the moment, I take these dividends and reinvest them in the shares that paid them, increasing even more the pay check that I will receive the next quarter. I like to refer to this as the double compounding effect: using dividend checks to buy more shares of shares that by themselves increase their dividends every year. The cross over point will be when my monthly checks are greater than the monthly checks from my occupation. I expect this to take a while but I am getting closer year after year. At that point I might as well retire since my portfolio will be doing more financial lifting than my job. Although I don't expect to quit working since that would be boring, the option always is open if I for whatever reason want it. Having multiple sources of income and not having to worry about living expenses buys one freedom of choice and independence. My current dividends already cover my utility bills, food, gas, internet. I no longer have to worry about being hungry ever again :) The next step is to cover my housing costs with dividends! 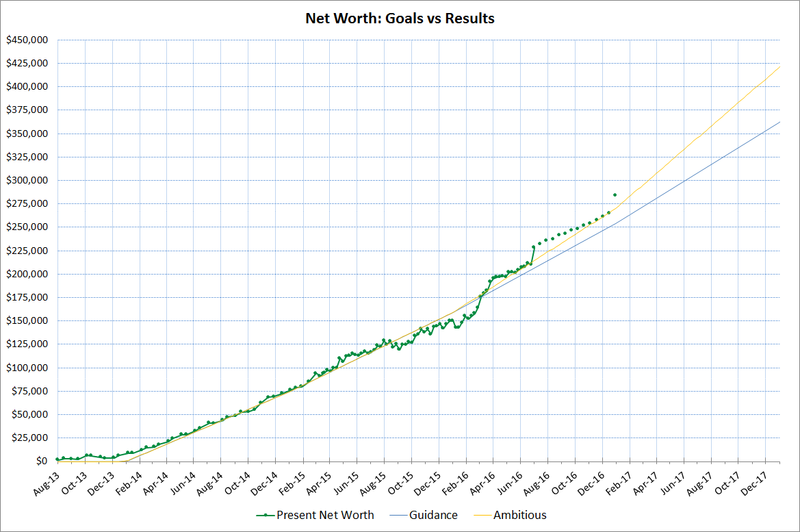 My goal is to hit $1,000,000 in dividends in my early 30's. With this amount of capital, I believe I can conservatively receive $25k to $30k a year in dividend checks from the businesses I own. At the moment, I am almost crossing the 1/4 million mark so I still have a ways to go. The reason I put the dividend so low at 2.5% to 3% is because today's interest rate environment is so low. 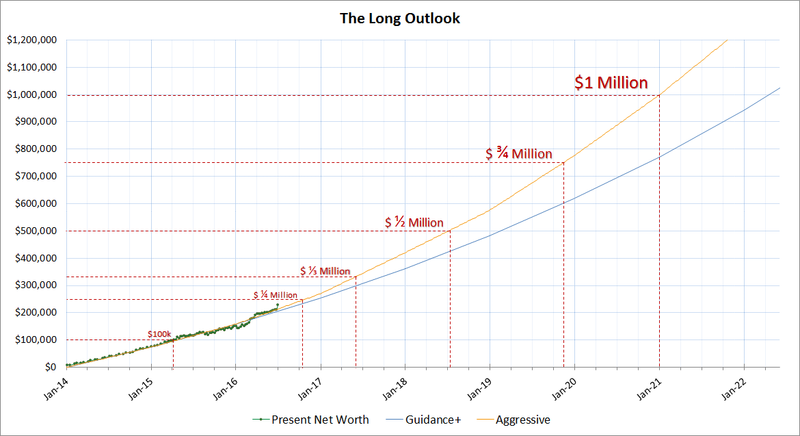 If the interest rate is higher I would increase this dividend goal to $30k to $40k. But I don't foresee interest rates going up high quickly. I could reach for stocks with yields higher than 4% to boost my yield up, but I find many of the investments above 3.5% to be very risky or debt laden or in a sector that is highly cyclical. I've reached for yield before and have always gotten burned. Slow and steady wins the race. Don't chase for yield! As of the end of 6/30/2016, my portfolio sits at $232,000. There has been a jump up from last month to this month due to a non-typical influx of cash from my primary vocation. My portfolio sits at $36k in cash which is way more than what I would like to hold. But it is what it is and I'm going to be patient until I can see something I think is worth buying. In the June month, I started new positions in Nike and Home Depot. I consider both to be the highest quality companies in the Discretionary sector, with Home Depot being more cyclical due to its relation to the housing market. I have added quite decently to my position in Abbott (ABT) and Air Products and Chemicals (APD). ABT now sits at around $6k and APD at $3.7k. I am looking to add more to APD and believe ABT is still undervalued. I have sold my small position in AbbVie (ABBV) this month to swap those funds with Abbott. My position in Altria (MO) still continues to climb. It is at record high levels and its valuation worries me but I will still continue to hold it. Buy and hold and collect dividends is what I like to do even if the company is expensive. I do not plan to trade in and out of my companies that provide cash to me every quarter. Right now Altria sits at almost $13k. Following closely is Realty Income (O) at $10.7k, Johnson and Johnson (JNJ) at $10.7k, Phillip Morris (PM) at $10k, AT&T (T) 8.3k, and General Mills (GIS) $8k. Since my portfolio is constantly growing, I don't consider these to be super sized positions since they will eventually be smaller in %. General Mills and AT&T have been performing very well recently. General Mills also recently announced another 4% dividend hike this month. There have been two raises so far this year for GIS which places their year over year increase at 9.09%. Not bad for a boring old cereal company! Conservative stocks, especially the utilities and those that operate only in the USA, continue to grow in share price in the aftermath of Brexit. My positions in XEL, SO, NEE are getting very expensive and I'm sad that I can't add to many high quality utilities that have been on my buy list for a long time. Time to wait until the Fed raises interest rates on these guys. I would like to work on adding to my Health, Industrial, Discretionary, and Material sectors. I expect that the Utility sector will need to cool off a lot before buying which will take a while. I've seen what interest rate hikes can do to high yielders like Utilities and REITs. I will wait for the panic selling. 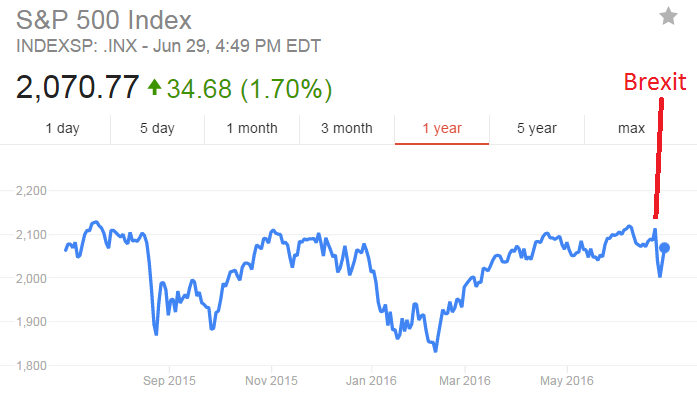 Right now they are sitting on cloud 9 because the Brexit vote will cause the Fed to keep rates lower for longer. I prefer to stay away from banks due to their unpredictable and volatile nature (the lending business just ain't for me, and the 2008 crisis and the Brexit uncertainty doesn't help change my view). For Financals, I prefer owning businesses that don't expose themselves to lending risk, such as Visa and Mastercard which just act like middlemen collecting commission for each transaction. I don't like American Express as much because they themselves lend money to others while providing their card network services. Visa and Mastercard do not, they have the banks and other institutions do the lending. I may consider owning insurance companies though. Chubb (CB) is one that I like. Chubb recently got bought out by Ace and Ace decided to keep the Chubb name. Chubb is my favorite insurance company besides Berkshire Hathaway (they're a conglomerate really). Chubb was a dividend aristocrat before the buyout. I also do not like fossil fuels and want to have my portfolio not depend so much on OPEC and oil prices. I avoid MLPs and REITs due to their high leverage and interest rate sensitivity. I also do not like the complexity of the MLP structure, complicated taxes with the K-1, the share dilution to fund projects, and sensitivity to oil prices. Despite many saying that MLPs run on a toll-rode model, oil companies won't pay them if they're going out of business! For REITs however, I will make an exception for Realty Income (O). Like a company forecasting earnings, I try to predict what my earnings will be in the coming quarters. The estimates below assumes that the market stays flat throughout the year. I do include monthly dividends paid. I made my estimates based on my average expenditures and expected earnings every 2 weeks. I tend to have jumps in earnings during different quarters. The isolated Green dots are my estimates until the end of 2016. I will be raising my 2016 end of year guidance from $260,000 to $280,000 due to higher than expected earnings and reduced living cost expenses. That concludes this month's update. You have a solid looking portfolio. You have amassed a lot to be such a young investor. Your goals seem to be very realistic to me and you are on pace to knock them out in no time. I added you on my Feedly and I look forward to reading your blog! Thanks for sharing! I don't usually describe the amount of cash put in, but my contributions are the significant part of my returns in the first few years as I accumulate a decent base. I invest around 66% of my take home (after tax) income. The other 1/3 is spent on housing/food/entertainment/etc.